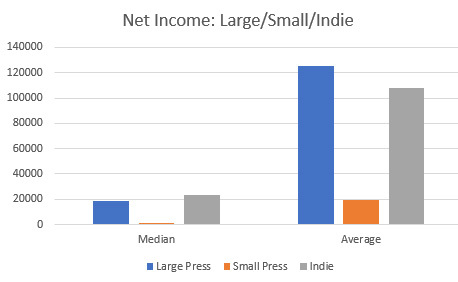 I wanted to focus next on large press vs. small press vs. indie/self-publishing. The goal is not to settle the neverending argument about which route is better, because that’s a silly argument, and I’m not going to waste time on it. Analyzing income data this way was tricky for several reasons. What qualifies as a large press vs. a small press? What about hybrid authors who choose multiple paths? And how does the self-selected nature of this study’s participants skew results? 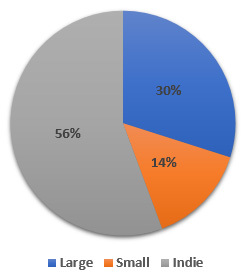 The survey asked how many books you published with a large publisher, a small publisher, and through self-publishing in your lifetime, and how many books you published with a large publisher, a small publisher, and through self-publishing in 2016. Respondents used their own judgement to decide what large/small/self-published meant with respect to their work. The majority of authors qualified as hybrid, with books in more than one category. So for this analysis, I looked at how each author had published the majority of their books during their lifetime. For example, with 12 books through large publishers, 1 small-press, and 1 self-published novel, my personal data went into the Large Publisher bucket. Someone with 4 large press, 5 small press, and 2 self-pubbed would be in the Small Publisher bucket. As for the self-selection part? I cast my net as wide as I could, but that net went out mostly through writing boards and email lists and social media. Someone who self-published a single book as a hobby or for the fun of it would be less likely to hear about the survey. Likewise, authors who published a lot in the past but aren’t actively writing/publishing today wouldn’t necessarily be “in the loop” for this stuff. I can’t say exactly how this affected the data; only that, as I mentioned yesterday, it isn’t a truly random or representative sample. But with 381 authors weighing in, I still think it’s a pretty good one. Again, keep in mind that the information here is correlation, not causation. Deciding whether to try to publish with a large publisher, a small press, or to self-publish is so much more than just looking at the data from a single survey. Each path requires a lot of work, and I strongly recommend everyone do their research before deciding what’s going to work best for them. I started by looking at the gross income (before expenses) for each category. Well, that’s not entirely true. I really started by doing a poll on Twitter to ask people which group they thought would have the highest net income. I figured that could let us tap into common beliefs and compare them to the data. Here’s what the informal Twitter results had 74% of people expecting Large Press authors to be the biggest money-makers. Self-published came in second place, with 17%. Small Press was at 9%. Average income followed a similar pattern. A handful of people left this question blank. They’ve been omitted from this part. If someone reported a 0 for this question, they were included. Here are those numbers, with median first and average in parentheses. 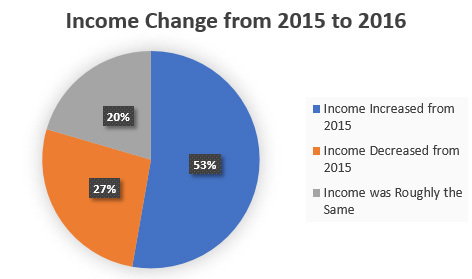 One of the questions I asked was whether people’s writing income had increased, decreased, or stayed roughly the same from 2015 to 2016. I think it’s encouraging that 53% of all respondents saw an increase, with another 20% reporting that their income remained roughly the same. Writing novels tends not to be the most financially stable profession, but only 27% reported seeing their income decrease. I wanted to see what happens when we separate it out. Maybe indie authors are seeing more growth than large press? 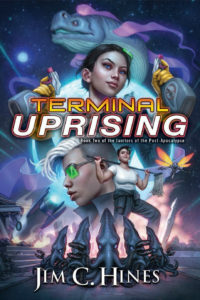 Maybe small press is surging forward? This got interesting. 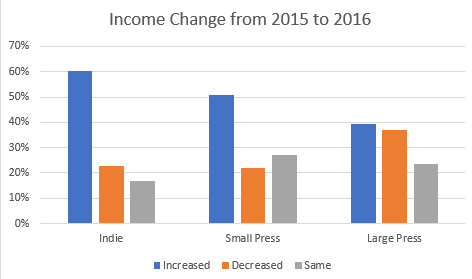 60.4% of indie authors saw an increase in earnings, compared to 50.9% of small press and only 39.5% of large press authors. 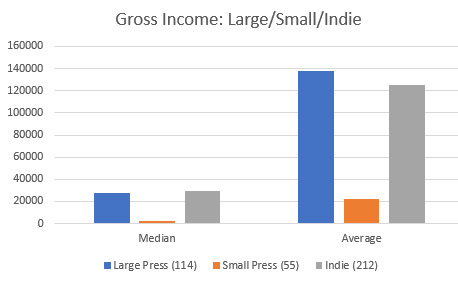 Only 17% of indie authors saw their earnings decrease, compared to 27.3% of small press and 23.7% of large press. Like I said, I’d be careful about drawing broad-sweeping conclusions from any of this, but it’s certainly an encouraging sign for my indie author friends. Realistically, though? Given the economy, the fact that all three groups saw more increases than decreases is a very good thing. I’ve got a lot more data to play with. I want to look at factors like genre, hours/week spent writing, hours/week spent on promotion, total number of books published, how long ago the author started publishing, and more. Short version: I have plenty to keep me busy in the coming days! Mari – You’re very welcome! This is very awesome. Thank you! Also is the comma in the wrong spot on that indie average in parenthesis? I might be reading it wrong. Tina Gower – D’oh! Fixing that now, thank you. These reports are fascinating food for thought. Keep up the good work! 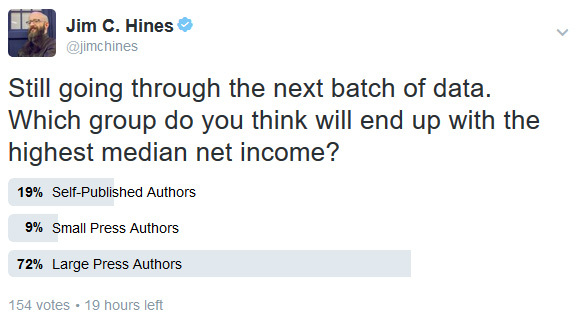 Not at all what I’d have predicted, especially for indie authors. It’ll be interesting to see whether you can tease out the role of factors such as productivity and promotion. Something’s weird here; does “income” mean gross receipts or net profit? 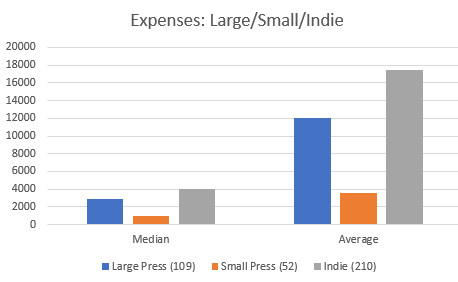 I don’t see how the expenses of large press authors can run 72% of the indies. Possibly this is skewed by ebook publication expenses being much less than paper (the indies might be publishing more ebook units), but that seems implausible. Raven Onthill – I’m not sure what you’re asking here, since the graphs and sections are labeled as gross or net income. The numbers seem plausible enough to me. I’m one of the large press data points here, and my expenses include things like conventions (mileage, meals, hotels), postage, web hosting, cell and internet for business purposes, my P.O. Box, bookmarks, business cards, and so on.